All of the edges of the bonding has been accomplished. The edge of the bead has been glued with a glue gun. That will take a few minutes as you wait for the glue to set because it is under some pressure. Take your time to hold it in position until set firmly and cooled. 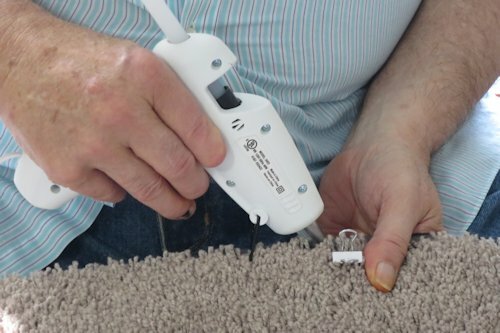 Now Paul springs into action as a bead of hot glue from a glue gun is applied to the valley between the rug edge and the round bead of the bonding material. Paul uses a white clamp to show where he began gluing.